Search using the Search window. Browse using the Catalog or ArcToolbox window. In addition, tools can be found on menus and toolbars. ArcGIS is installed with a few commonly used tools on the Geoprocessing menu, and you can add tools to any menu or toolbar. Click Geoprocessing > Search For Tools. As illustrated below, the Search window has four filters: All, Maps, Data, and Tools. Both the All and Tools filters will return tool results. When searching for tools, the best results are obtained using the Tools filter. The Search window Home page button takes you to the geoprocessing tools home page, illustrated below. The home page lists all installed system toolboxes. 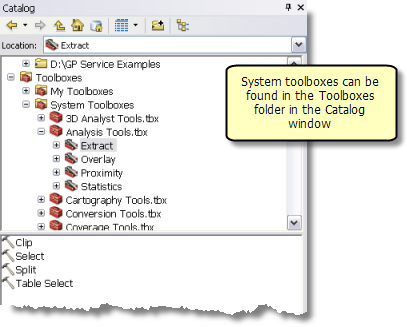 You can click the toolbox name to examine the contents of the toolbox—its toolsets and tools. Custom toolboxes (toolboxes that you create) can be examined by clicking the Find My Custom Toolboxes link. Only those custom toolboxes in folders that you index can be found in the Search window. To add a folder to the search index, click the Indexing Options button . If you know the name of a tool, you can enter it in the Search window. If you don't know the name of a tool but can think of some words that describe what you want the tool to do, you can enter the words and search for all tools that match the words. You can type the first few letters of a tool name to populate the drop down list. You can then highlight an entry in the drop down list using the up and down arrow keys or your mouse. 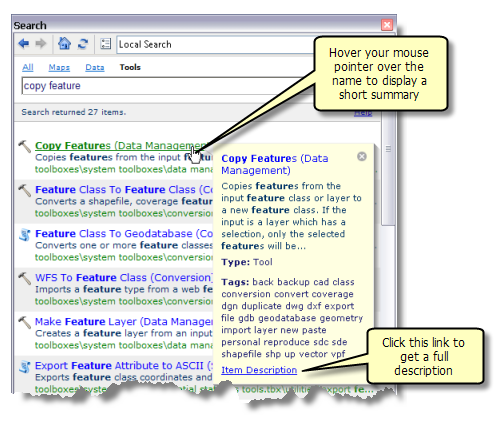 Once you've highlighted the tool, press CTRL+ENTER to open the tool dialog. There are a number of things you can do with a search item. If you pause the pointer on the item, a short description of the toolbox, tool, or geoprocessing package will be displayed (toolsets do not have descriptions), as illustrated below. The Item Description link in the short description will open the description of the toolbox, tool, or geoprocessing package. You can also open the item description by clicking the first line of text below the tool name. A search item contains the path to the item. Click this path to open the Catalog window with the item expanded. 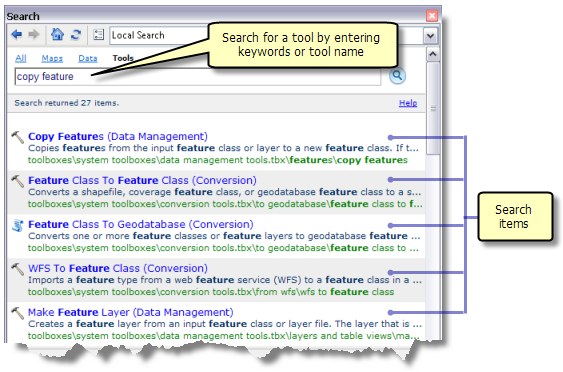 You can open the tool dialog box directly from the search item by clicking the tool name. You can drag a tool into the ModelBuilder window or the Python window by selecting the name. 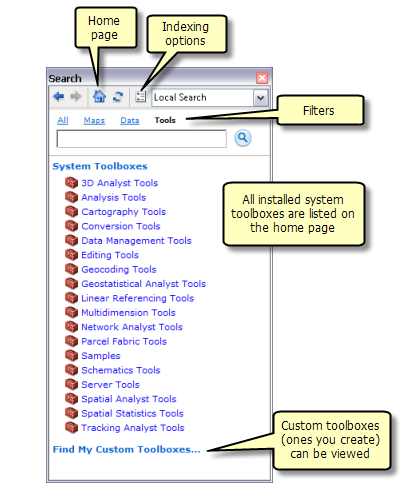 System toolboxes (those installed on your system with ArcGIS) can be found in the Catalog window by expanding the Toolboxes folder, as illustrated below. Custom toolboxes can be found by browsing to the folder or geodatabase in which they reside. Once you've found the tool, you can open the dialog box by double-clicking the tool or right-clicking the tool and clicking Open. You can also drag tools into the ModelBuilder or Python window. You can customize the contents of the ArcToolbox window—adding and removing system and custom toolboxes until you have just those toolboxes that you use most often. The contents of the ArcToolbox window is saved with your map document. 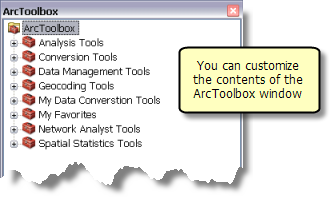 The illustration below shows the ArcToolbox window with six system toolboxes and two custom toolboxes (My Data Conversions Tools and My Favorites). You browse and open tools just as you would with the Catalog window, expanding toolboxes and toolsets until you find the tool you want, then double-clicking the tool to open its dialog box. You can drag tools from the ArcToolbox window into the ModelBuilder or Python window. The Geoprocessing menu comes with six tools on its menu: Buffer, Clip, Intersect, Union, Merge, and Dissolve. You can customize this list by removing tools or adding your own tools. You can add or remove tools on any menu or toolbar.